Author: Dorothea E. Schulz. Series edited by: Beatrix Heintze, Karl-Heinz Kohl. The book describes continuities and changes in the political significance of jeliw (sing. jeli), praise singers, in Mali who performed crucial tasks of reputation management on behalf of wealthy and powerful families in the nineteenth century. Based on extended research in rural areas of southwestern Mali and in the capital Bamako, this study illustrates the effects and limitations of a mode of symbolically constructing rightful rule, and of its transformation in a changing institutional context. The performances of jeli musicians on broadcast media are taken as a starting point to illuminate two aspects of state formation in Africa: the emergence of a public domain established by broadcast media, and the creation of a national culture. Sociopolitical change and the commodification of praise performances have undermined the patronage relations between jeliw and patron families which once provided the institutional context for the jeliw's symbolic representations of power. Today praise performances of jeli praise singers do not validate their patrons’ claims to positions of influence in national politics. Since the creation of Mali as an independent state in 1962, jeli musicians and traditionists have contributed important elements of a “national” culture while drawing primarily on the music, cultures and traditions of southern Mali. Some of them, mostly women singers of sometimes international renown, have become emblematic figures of Malian popular culture. Because their music is predominantely displayed in the public domain established by the national radio, they sustain the homogenizing effects of the governmental politics of culture. But their music also serves listeners from the south as a medium to assert the particularity of their local traditions in a multicultural nation state. 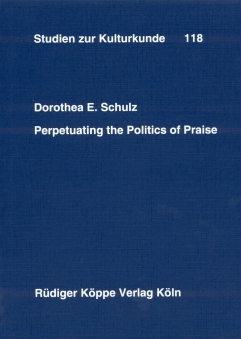 Schulz has to be praised for her theoretical orientation; the book is clearly related to issues in present-day Africa. Schulz rightly criticizes the many scholars who tend to quote many “classic” works on Mande ethnography that are preoccupied with explaining the jeli’s social position and which make little effort to relate their findings to contemporary theoretical issues in Africa. This implies a danger of producing essentialist notions of culture and behavior. Schulz, however, takes the theories on state formation and on patron/client relations as her point of departure and focuses on the way political institutions search for legitimacy (and/or hegemony) and on the structural transformations of the public sphere that have taken place. This is the background she uses to present to the reader a wide range of jeliw and their activities.